Our usual deadline is the 15th of the month. If, for one reason or another, your story can’t be ready by the 15th, we need to know by the 15th that the story will be coming, and when. So when you submit a story, be sure to tell us who wrote the story, and what their relationship is to the story. If there’s no particular relationship to the story — maybe you just wrote it because you thought it was interesting — then we’ll put For the Beacon as the second line of the byline. Another possibility is that rather than a story with a byline, it’s a press release. If it’s a story written on behalf of an organization and authorship is irrelevant, then “Press release” is fine. If you can’t do e-mail, a clean typewritten copy is acceptable, as we can scan it into our computers and avoid having to re-type it. If you can’t do typewritten, then we’ll just have to deal with handwritten. It either case, you can either drop it off at the Andover Town Hall (tell them it’s for the Beacon) or you can mail it to The Andover Beacon, PO Box 149, Andover NH 03216-0149. We don’t have a “calendar” section, so we really can’t deal with things that don’t look and feel like an article, i.e. proper sentences and paragraphs. And it needs to be long enough to look like an article — just date, time, and place probably isn’t enough to get anyone off the couch, so it’s probably not worth printing. The more useful, engaging information you can provide, the better it will serve our readers. When and Where Will It Appear? Because the Beacon is a non-profit community project, we’re very much Andover-centric and very much at the mercy of our budget and our volunteers. 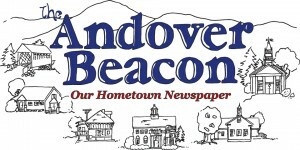 If we feel your article is relevant enough to our readers (as opposed to readers in Nashua, say, or Boise, Idaho) and if we have enough volunteer help at the time, we’ll post it to the Web site at AndoverBeacon.com as soon as we can. If there’s room in the next monthly print edition and the article is still relevant on the publication date, we’ll try to include it, but keep in mind that print pages are very expensive so we have to be very selective about what appears in print.